This wall desk features two areas to store your CPU, monitor, keyboard and mouse. 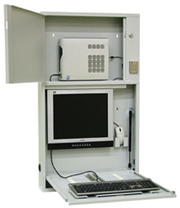 The two-lock system provides extra security. Colors: Beige & Light Grey (Contact Franklin Mills for custom colors). Construction: Heavy gauge steel. Size: 42"H x 241⁄2"W x 4"D. Contact Franklin Mills for special pricing.